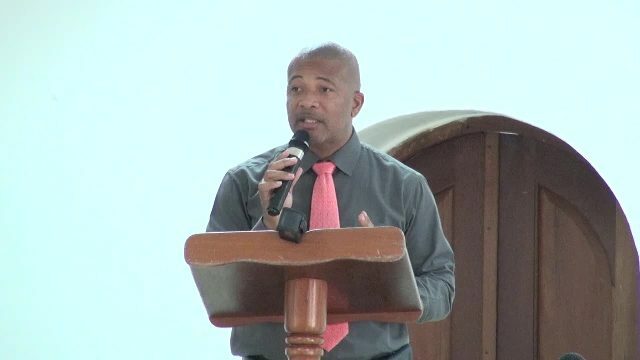 The Honourable Spencer Brand, minister of labour, public works, physical planning, posts and environment in the Nevis Island Administration, delivers remarks at a recent meeting at the St. Pauls Anglican Church Hall with members of the Cabinet and senior civil servants. Charlestown, Nevis – During a recent meeting of Cabinet with senior civil servants at the St. Paul’s Anglican Church Hall, the Honourable Spencer Brand, the new minister of labour, public works, physical planning, posts and environment in the Nevis Island Administration (NIA), urged civil servants on Nevis to cease taking advantage of the mechanisms in place for sick leave and leave of absence. “I am not saying that if a person is sick that they ought not to allow themselves to recuperate, but I think that the idea here is to try and discourage us from abusing the extended sick leave mechanism,” said Brand, whose background stems from more than 20 years in the private sector. “I believe also that the frequent leave of absence is something that is also creating some headache for the government as [people] might be also abusing that mechanism…I would hope that all of us can begin to appreciate that if you lose one of two days on the job, it can have a knock-on effect, so to speak, on the job somewhere down the line,” he said. The minister also told civil servants they should exercise honesty where the issue of sick leave is concerned. He said in cases where they are ill, they should allow themselves to recuperate to be able to function optimally while discharging their duties, but if they were not ill, they should desist from the notion of frequent leave of absence. Brand acknowledged that he is transitioning into his new job in the NIA, saying it is a new experience and a new feeling to no longer be his own boss. However, he pledged to do his best to live up to the expectation of the Cabinet and to the people of Nevis. Brand, who is the representative of the parish of St. Pauls, was sworn into office Dec. 24, 2017, following the recent Nevis Island Assembly elections Dec. 18.